6 months on the protective diet has changed my life completely. My weight dropped from 188.5 lbs to 171 pounds . 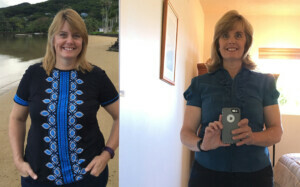 17.5 pound loss, plus I have lost more than 10 inches of fat. I went from size 14 to size 10. From large size to small size. The smaller clothes that were in my closet are now too big. Definitely dealing with BCS!!! My energy is excellent. I can now exercise and swim with much better speed and endurance. My cholesterol reading as of June 20, 2017 is 225. My overall cholesterol before PD was 267. I am looking forward to it continuing to drop as I continue on the road to optimal health. I love the protective diet. I have no cravings and no guilt. I love cooking PD recipes and packing my lunch with delicious PD foods.